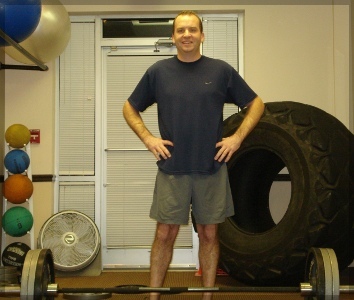 Shawn Sullivan began training with me in December 2010, and immediately proved to be a formidable competitor. He currently holds four of our men’s club records in max strength and speed-strength events. A father of two and busy working professional, the limited amount of time Shawn devotes to personal training (2-3 days/week) is calculated and precise. I joke with him saying, “All you do is come in here and break records!” All kidding aside, his relentless pursuit to achieve his best is certainly impressive. Since beginning his training regimen, Shawn has continued to combat old, nagging injuries brought on by working hard and playing hard. Without proper attention to correct postural and muscular imbalance issues, these injuries (if left unchecked) would inevitably get worse. Shawn is a perfect example of someone who is not willing to settle for mediocrity. He has taken advantage of all the resources available to him here. In addition to training, body composition testing and nutrition counseling, Shawn has regularly scheduled therapeutic massages with Sallie Gentry and chiropractic care with Dr. Charles Hecht. Good work, Shawn! It’s a pleasure watching you compete!